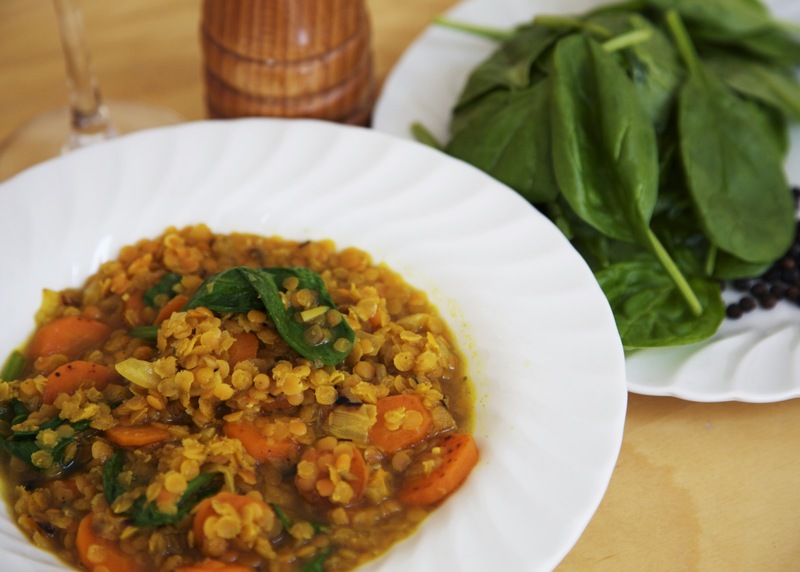 A delicious vegetarian meal rich in fibre, vitamins, minerals and iron from the lentils. Serve with warm flat breads or brown basmati rice. Peel the potatoes and cut into chunks. Put them in cold water to stop them discolouring. Peel and thickly slice the carrots. Peel and thickly slice the parsnips. Rinse the lentils in a sieve under the tap. Heat the oil in a large pan. Add the onion and garlic and cook for a couple of minutes over a medium heat, stirring occasionally. Drain the potatoes and add them to the pan. Add the carrots and parsnips. Turn the heat up a notch and cook for about 10 minutes, stirring until the vegetables are golden. Stir in the curry powder. Pour in the stock and bring to the boil. Reduce the heat, add the lentils, cover the pan with a lid and simmer for about 20 minutes until the lentils and vegetables are tender and the sauce has thickened. Taste and add a little salt if needed. Rinse the spinach. Stir most of it into the pan and cook for another couple of minutes. Pour in the yogurt, add the rest of the spinach, stir and serve.